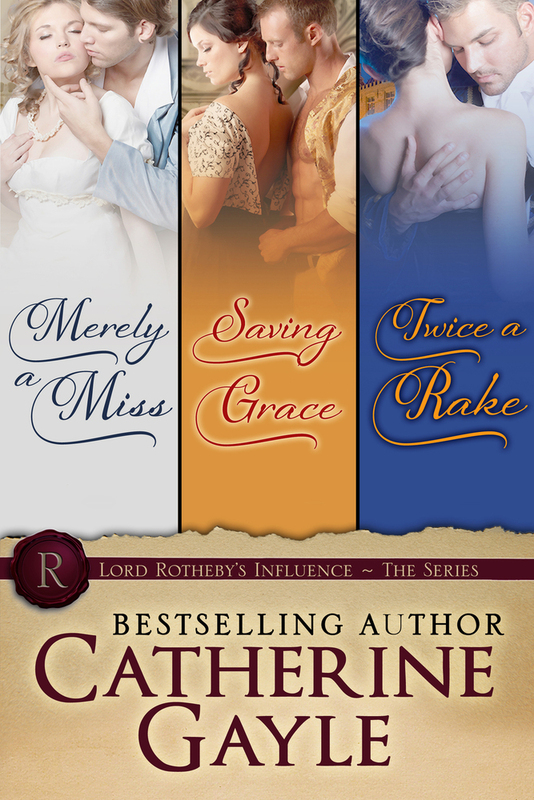 The first three full novels in Catherine Gayle’s Lord Rotheby’s Influence series, available now in a single box set. When Aurora Hyatt loses her journal in Hyde Park, her ruin is a foregone conclusion. If anyone discovers her writings, they'll find scandalous fantasies involving the newest rake in Town alongside entirely-too-candid thoughts about her typical dreary suitors. Aurora will either be forced into a loveless marriage with the first nodcock to make an offer, or she'll be assigned a permanent position on the shelf. What catastrophe will God smote down upon her next? If Niles Thornton, Baron Quinton, desires to maintain any semblance of his current lifestyle, he must fulfill the requirements his grandfather, Lord Rotheby, has set for him. When he is nearly barreled over by a racing curricle and a journal lands at his feet, his troubles are over. Inside the journal’s pages, Quin discovers a scandal waiting to happen. Surely a young lady who would write such brazen things in a journal must recognize the necessity of a hasty marriage, even if the gentleman making the offer is less-than-honorable. In a drunken haze, Quin kisses Aurora on a crowded ballroom floor, necessitating their immediate marriage. His troubles are only beginning, as Aurora's writings are soon the focus of both gossip rags and drawing room conversation. When word arrives of an even greater scandal following in his wife's wake, will he prove himself a drunken abuser like his father or the loving husband of Aurora's fantasies? The blasted man will not stop following her. Well, he isn’t following her…not exactly. They are just always thrown together, and he is everything she wants but can’t have. It is downright infuriating—especially when he kisses her. Lady Grace Abernathy has been ravished and left pregnant. This would not be such a gargantuan problem if Lord Alexander Hardwicke would simply stay away from her as she asked. But leave it to her meddling Aunt Dorothea to continually thrust the two into each other’s company against both their wishes. These distractions are more than a lady should be forced to bear. Alex left London to visit his deceased father’s oldest friend, Lord Rotheby, and to get away from his mother and her matchmaking schemes, only to run into more of the same at every turn. But the more time he spends in the company of Lady Grace, the less he finds himself able to ignore his growing attraction—and his burgeoning need to protect her. Must he cause a scandal in order to protect her from one? Miss Jane Matthews feels completely out of place amongst the finery of the ton. She’s the daughter of a country vicar, for goodness sake, and nearly a spinster to boot. But when her distant cousin—a dowager duchess, of all people—offers to sponsor her for a Season in London, she agrees, but only so she can search for a storefront for her business. Perhaps, in that regard the Season won’t all be in vain. The widower of a loveless marriage, Peter Hardwicke, the Duke of Somerton, has already done his duty and provided an heir for his dukedom, so he sees no reason to remarry. Taking a wife would only mean adding a new responsibility to his already too-full schedule. He’s more than busy enough keeping his family in line—not to mention sorting out the myriad problems plaguing one of his estates. But when Lord Utley, a childhood friend who has been on the wrong side of Peter’s ire for many years now, takes an unlikely interest in Jane, Peter has to intervene. He’ll be damned if he’ll allow Utley to ruin yet another life. But will rescuing Jane from Utley’s clutches land Peter with another loveless marriage?